I would like to share with Society members a little news concerning one of Kenneth Wynn’s classic Penguin book covers that I recently discovered. I am a collector of military art and my eye was drawn to picture on a well known auction website in February of this year. 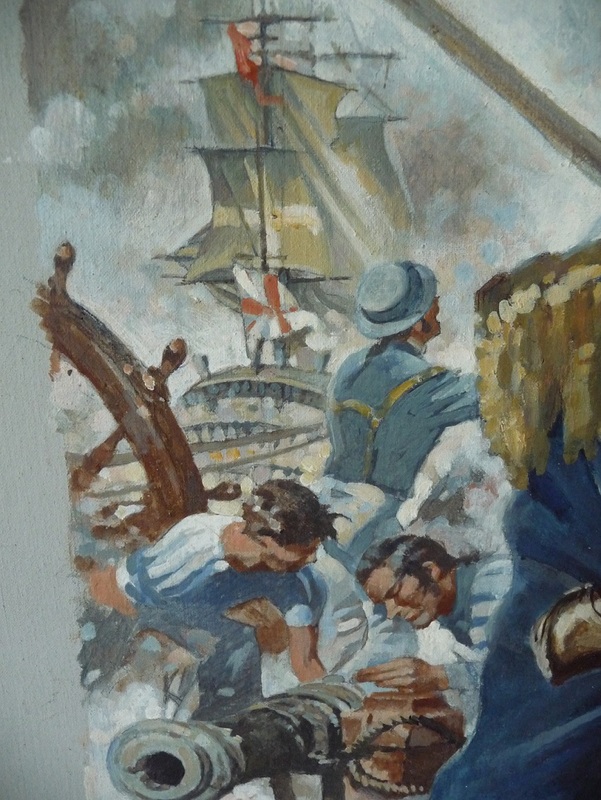 It was simply described as ‘Acrylic on board – Admiral in Battle’. Two sentences provided the only further details. That was it. Unsigned and with no provenance, but with a quality that fairly shone out even from the small images upon my computer screen. Someone with talent had obviously produced this and with a ridiculously low initial listing price I thought I should have a bid or three. The listing week dragged on painfully slowly, and even though I had put a serious bid on it the price crept up only slowly. The long time seller had 100% positive feedback so I was confident of it’s authenticity, and every day I checked the website expecting to see my generous bid topped by a high margin. It wasn’t but still I didn’t do any research on the work fearing that in itself would be ‘the kiss of death’ for my hopes of being the winning bid. The last day of bidding came along and I sat in front of the computer for the last hour. I had gone from being nonchalant at the beginning to being desperate towards the end. I wanted that picture! With ten minutes to go the price moved up, but I had covered it, then again but my money was still the higher amount. Then that was it. The ‘Admiral’ was mine! I couldn’t believe my luck, especially when I received the well packaged piece three days later and it was stunning ‘in the flesh’. Now I could start my researches in earnest. A good friend of mine cast over his critical eye..
With the less than helpful assessment I looked at old film posters on line. Within moments I had the images of the 1951 film up ‘Captain Horatio Hornblower’. Yes, the costume was identical but none of the advertising artwork at the time looked anything like my purchase. A book cover perhaps was my next thought so I started looking through various fronts from the last fifty years before typing in ‘Hornblower artists’. Kenneth Wynn was one of the results and I looked at his website. 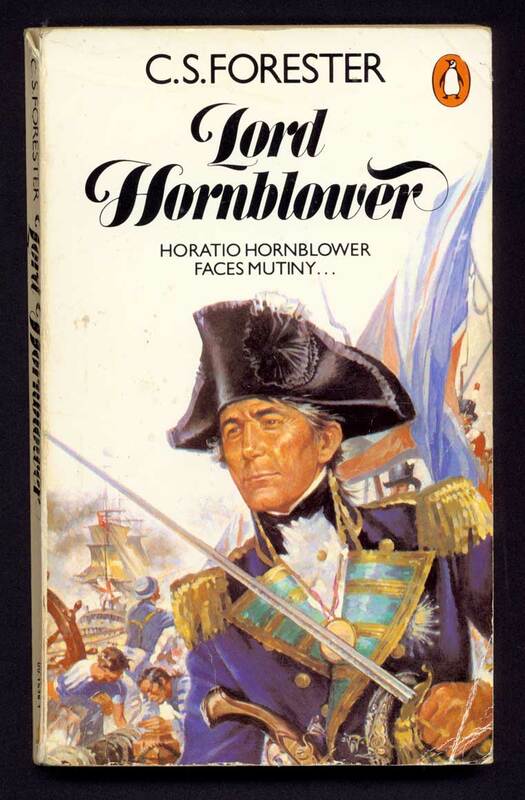 And there it was, my picture for the second Penguin reprints for the book ‘Lord Hornblower’. A further image on the company he was associated with revealed the man himself standing alongside the work at a ‘Trafalgar Night’ dinner at a hotel in his home town of Brighton shortly before his death in 2009. 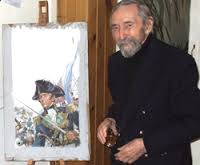 My painting was smaller than the one shown in the photograph and it instantly became apparent it had been neatly ‘cut down’ to remove the ‘dead space’ above the flag behind Lord Hornblower. This in no way detracts from it at all as every detail on the book front is there, plus a small continuation either side which wasn’t shown. Enhancing the image on the Trafalgar night picture I could see the ‘stipple’ or ‘wash’ waves that Kenneth had put onto the board before painting the main scene matched identically. An expert and main dealer of Maritime art later appraised the work at a figure quite significantly higher than I had paid making this one of the bargains of my collection, in fact maybe the ‘best deal’ I had ever made in all my years of dabbling! I did message the Kenneth Wynn website but my message was returned ‘undelivered’. I am intrigued to where the picture has been over the last few years as to the dealer I purchased it from it was just another piece of his ever changeable stock. Was it once auctioned off at a Trafalgar night? Was it cut down for it’s new frame but the owner never got round it? Would I ever be able to reunite it with other examples from the series? (A quick look on the Bonham’s auction site told me the answer to that question was a resounding no!) Reading various sources before I found the Society it seems that this depiction is a real favourite, one that really shows the Lord as he should look. On the strength of this lucky find I picked up a few of the books…and now hooked will have to read the whole lot! Thank you Kenneth. Hi. I am reading this quite fascinated by your interest in my old friend Ken Wynn. I am so sorry you had no reply from the website, it ws I who set it up just after he died. I have a lot of Kens original sketches, watercolours et al including two of his original (full size and not cut down) Penquin book cover paintings, one of them being a Hornblower – “The Commodore”. They are both oil on board and we bought them straight from Ken many years ago. The model he used for the Hornblower series was, in fact, his bank manager! Do message me through Facebook – Deena Foster, or email me at fosterd@btinternet.com. PS. I am pretty sure that Ken kept the picture you have. He left everything to his long time partner and maybe she sold it to a dealer. I believe it had also been for sale at Bonhams in 2010 when a large lot of his painting were for sale, but I am not sure whether it was sold at Bonhams that day.